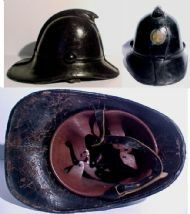 excluding those show in the London Fire Brigade and Helmets Ltd galleries. A helmet worn by a Street Fire Party volunteer, later their title was changed to Fire Party. 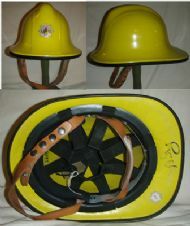 Worn by an officer of the Fire Party volunteers. 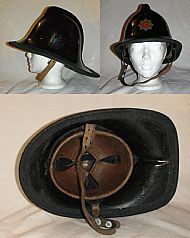 This is a MkII Brodie pattern steel helmet of the National Fire Service. However recent examination of this shell reveals that it is a South African helmet, with a British suspension. Therfore it's provenance is in doubt. subsumed into the National Fire Service and all helmets were repainted and badged for the NFS standards. 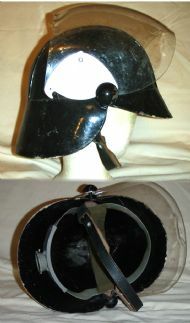 The MkII No. 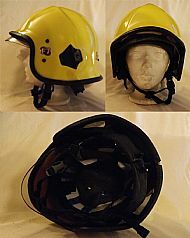 1 Rimless helmet was released by the Home Office only for civil defense and Home Guard use due to shortages of stainless steel used for the rim. It is fitted with a Mk I chin strap and a MkII liner. 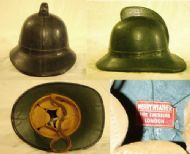 They had six sites in England, each one had a Fire Station. 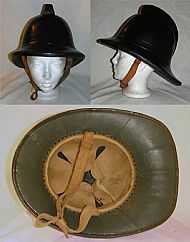 1952 James Hendry Airport Ptn. 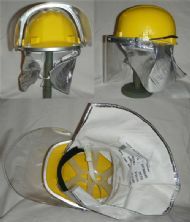 A Hendry Airport of the Civil Aviation Authority. 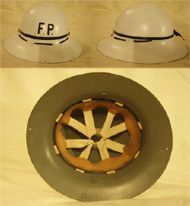 A fibreglass version of the Airport pattern. 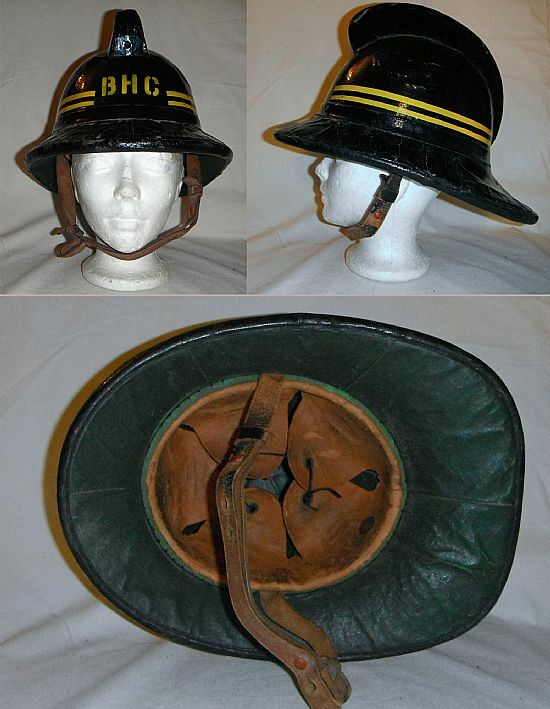 This is a very crude helmet but it has been confirmed as being made by Jas Hendry Ltd.
mainly for their superb leather helmets. 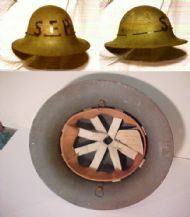 This would almost certainly have been used by a large private works Brigade as is marked up for a Sub Officer indicating a large enough manning to have a full rank structure. 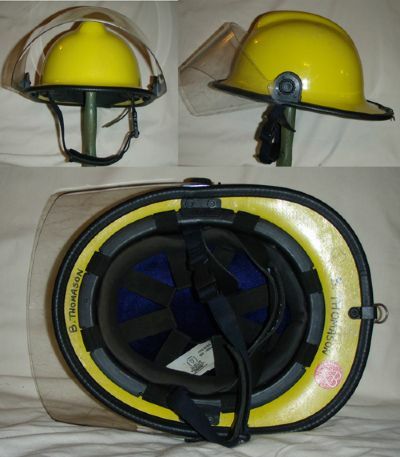 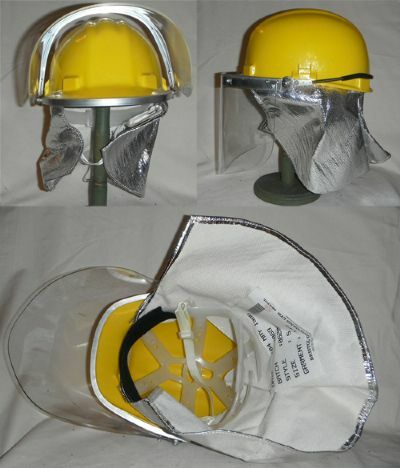 fibreglass fire helmet to be offered in the UK, it was not a great sucsesss as it only remained in production for 2-3 years. 1920 James Hendry Manchester Ptn. 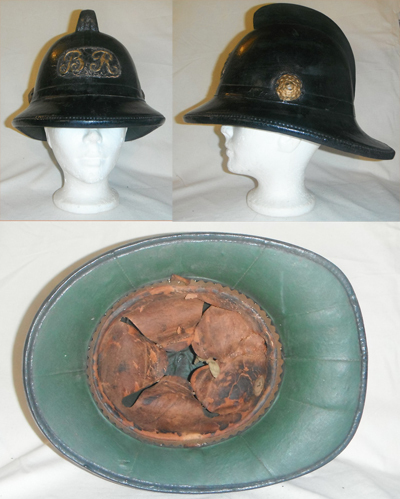 Merryweather or Rose & Co..
coat-of arms replaced this one and was in turn replaced by a smaller badge with The Red Rose of Lancashire in the centre around 1980.
known as a “Turtle”, for obviouse reasons. 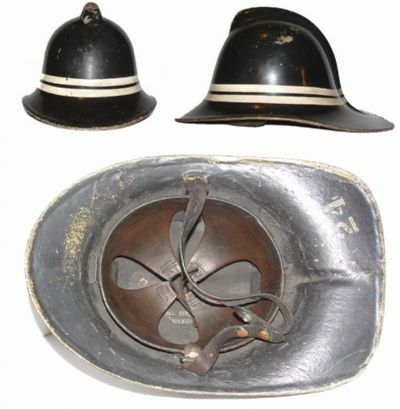 manfacturing capability some Fire Brigades turned to the huge supply of surplus military helmets for thier newly reformed Brigades. 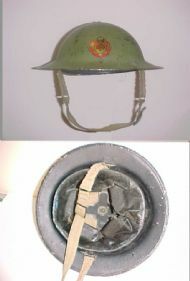 The “Turtle” helmet was not popular as it was heavy and uncomfortable and Brigades abandoned it as soon as they could for purpose made helmets. 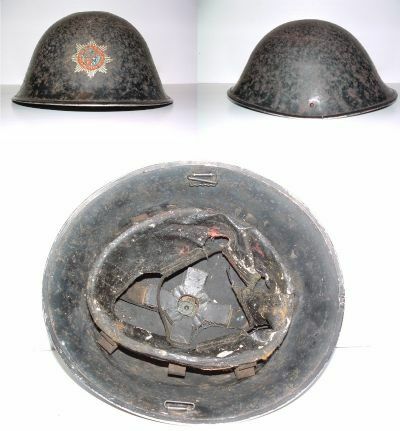 This helmet is a puzzle, it is a Dutch made lightweight fibreglass copy of the old “Brodie” steel helmet. upon Hull City Fire Brigade and part of the Lincoln (Lindsey) Fire Brigade and a small part of the West Riding of Yorkshire County Fire Brigade. It is inconsievable that the new Brigade would not have issued state-of-the-art helmets at this time. 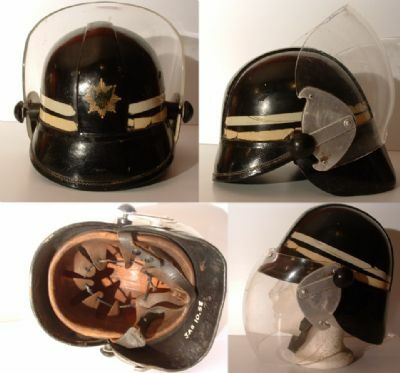 This is either a spoof or a film prop. Jo Bird Ltd. was primarily known for making fibreglass containers with a subsidery company making drive belts. 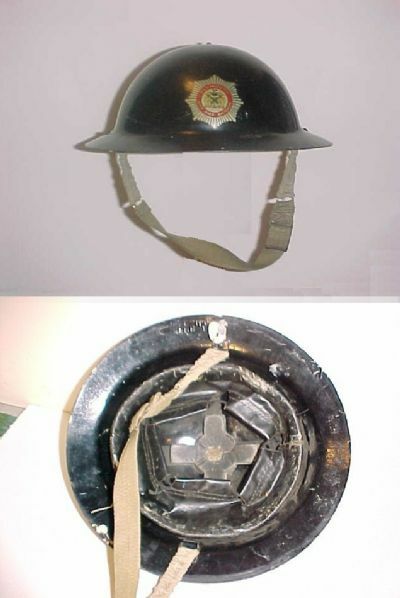 They briefly explored the Fire Helmet market with the Firebird but it was short lived. 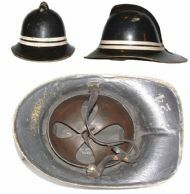 However around the same time Bristol Uniforms also marketed their own fire helmet who's liner bears some similarities to the Jo Bird, and was also marketed as "The Firebird"! A connection has yet to be confirmed. 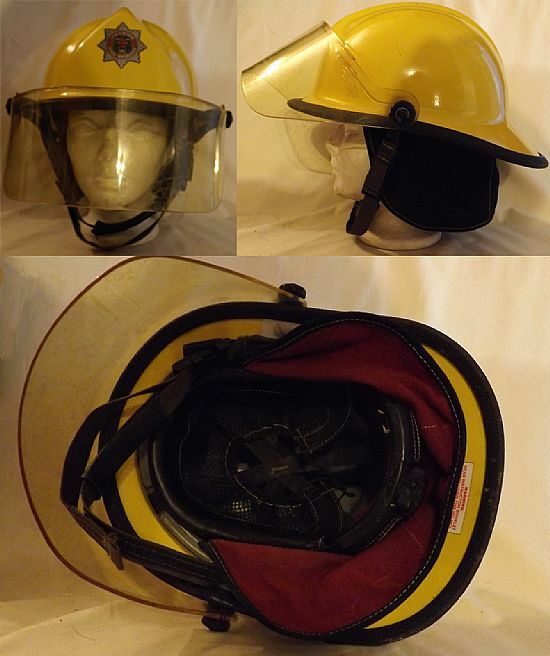 Bristol Uniforms 6216 (6225 with visor). 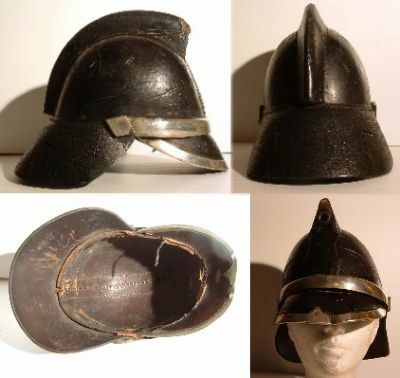 There is a bit of a puzzle with this helmet. 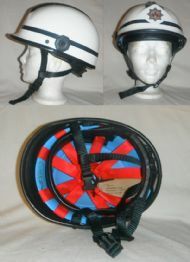 It has a quality control sticker inside which identifies it as a Firebird. 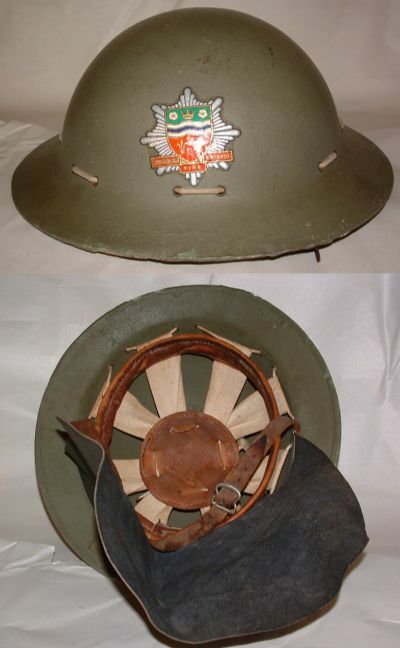 However Firebird helmets were made by Jo Bird & Co Ltd of Bristol! The Firebird helmet looks completely different from the Bristol. This Merryweather helmet (made by Helmets Ltd) is almost identical to the Cromwell NFBA helmet. 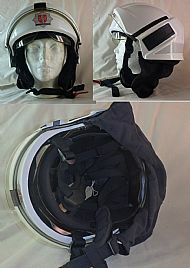 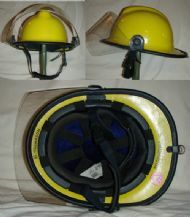 This a Pacific A3V3/R3V3/Kiwi officer's Search and Rescue helmet from the Higlands & Islands Fire Brigade,Scotland. 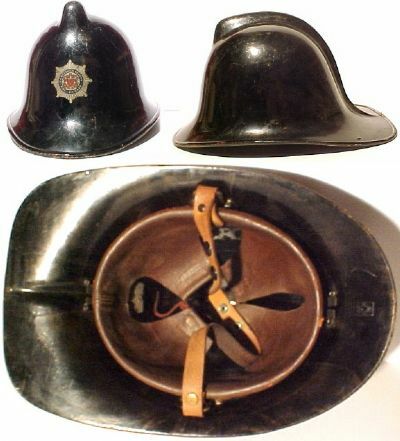 A very early version of the 2030 made by Helmets Ltd to be sold under the name of the uniform manufacturer J Compton, Sons & Webb Ltd, who supplied the Fire Brigade of the newly formed British Railways with uniforms. 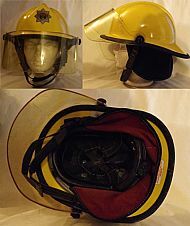 Badged for the National Fire Brigades Association. This same helmet appeared in the Pr-WWII Cromwell range as the NFBA. 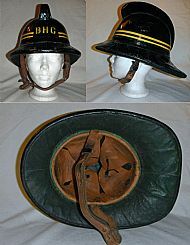 British Hub Co. Works Fire Brigade. 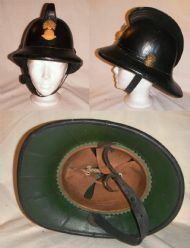 The same style helmet appeared in the Pre-WWII Cromwell range as the NFBA. Elvington Airport RFFS, Yorkshire Aviation Museum.